This is one of my most favorite dish for hosting big party. It’s simple, healthy, and very delicious. It’s one of the recipes that I don’t have to make any changes, as it’s perfect if you follow the exact ingredients. Of course, I made it so many times that I have made it with variations and tastes just as good. Garlicky Cherry Tomato and Bread Gratin Recipe – Jacques Pépin | Food & Wine. Preheat the oven to 375°. Lightly oil a 10-inch ceramic quiche dish. 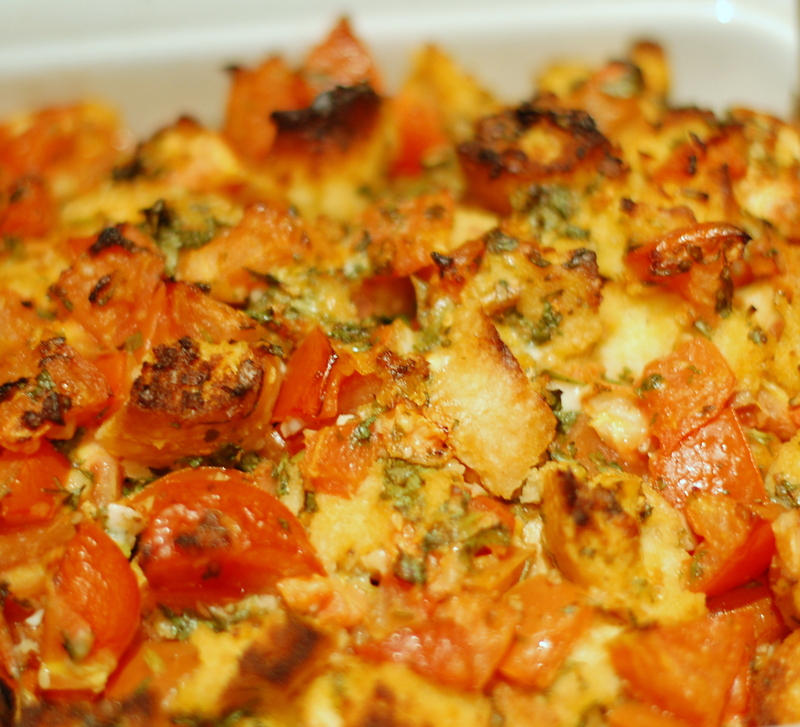 In a large bowl, toss the bread cubes with the tomatoes, olive oil, garlic, parsley, Parmesan and salt and pepper. Scrape the mixture into the baking dish and bake in the center of the oven for 35 minutes, or until the bread cubes are browned and crisp and the tomatoes are very tender. Serve warm or at room temperature. I usually use whole-wheat or whole grain baguette for added fibre. Make sure you use a day-old baguette, as it’s extremely hard to cut up soft fresh bread. I only used small cherry tomatoes once, usually I just chop some regular tomatoes that are ripe and sweet. You may mix Parmesan cheese and some Mozzarella / Italian blend cheese. You may add some chopped fresh basil, or fresh corn kernels for variations. Mince garlic instead of thinly slicing them.